Lecturer: Good afternoon, everybody. Today I'll be talking about the issue of waste, which has become an immense problem in today's society. We face huge challenges in terms of reducing its creation in the first place and then in dealing with it when it has been created. Now, the model of nature would be our ideal - a completely cyclical system in which no excess waste is generated that can't be processed by itself. However, we humans have proved, despite our apparent intelligence and ingenuity, quite incapable of achieving this. Where did it all go wrong? We have evidence that in ancient Greece and Rome governments operated municipal waste collection, and a huge Stone Age mound was identified some years ago in Norway as waste disposal, so we can see that people have been generating waste for a very long time indeed. However, during the Dark Ages, sophisticated municipal waste processing disappeared. The medieval answer to waste was to throw it out of the window. But this waste, apart from broken pottery and a few metal objects, was largely organic. Can the words 'throw it out of the window' be an answer to Question 32? --> No. They could form the answer to another question: What type/method of waste disposal was most common? This meant, of course, that it was quickly absorbed into the environment by the natural processes of decay. However, many concerned people, such as doctors, claimed that this created health problems, although it wasn't until science produced convincing evidence of the connection between rubbish and disease that governments began to see the importance of dealing with the problem effectively. Note: 'Link' in the question is expressed as 'produced convincing evidence of the connection between' in the ' tapescript, and 'waste' in the question is 'rubbish' in the tapescript. 'Health' is not the correct answer, as this refers to part of the tapescript where 'people, such as doctors, claimed' something in relation to the 'natural processes of decay’. Unfortunately, their response has remained slower than the generation of waste. It is very hard to deal with waste that won't melt into the environment, as so many of our modern consumer goods won't, and that's why the invention of plastic has caused the worst headache for the environment - it's more than nature can deal with. Note: Plastic, we are told, 'has caused the worst headache' - 'is the biggest problem'. 'Modern consumer goods' is not the answer: firstly, they are not a single invention; secondly, you cannot write this answer in ‘no more than one word', as the rubric requires. In order to address the root of the problem of waste, we need to think about what has made the quantity of waste accelerate in growth. I'd identify three main reasons. As many countries became industrialised, we saw the advent of mass manufacturing. This has been enormously damaging as it has greatly increased the amount of things on the planet's surface which don't go away by themselves. industrialised --> 'Industrialised' is an adjective, not a noun. A 'factor' needs to be a noun, or a noun with an adjective. damaging --> 'Damaging' is an adjective, not a noun. It does not make sense, as 'damaging' cannot lead to an increase in waste. amount of things --> 'Amount of things' is wrong for two reasons. Firstly, it consists of three words, and the question allows a maximum of two. Secondly, it has been taken from the tapescript without its context, so it doesn't really make sense. In the tapescript, the ‘amount of things' is carefully defined as 'on the planet's surface that don't go away by themselves'. Closely related to this is packaging - necessary for transporting things around the world, but then extremely difficult to get rid of properly. Note: 'Transporting things' is not the correct answer. Transporting goods is one of the reasons why packaging is used, but it is the packaging itself which forms waste. And a third aspect to the problem has been disposable goods. We have become accustomed to so many things being to use and then discard that we find it hard to imagine life without them. And yet we spare little thought for where they go when we do discard them. Note: Both words are necessary: 'goods' alone would not describe the reason for the increase in waste, which is that more goods are now designed to be thrown away after use. Right now, let's move on from where all this waste comes from to what is done with it all now it's here. Different countries deal with waste differently. Of course, each country also changes what it does, so the figures for waste treatment I've got here are likely to change in the future. Let's look at Municipal Solid Waste, or MSW. 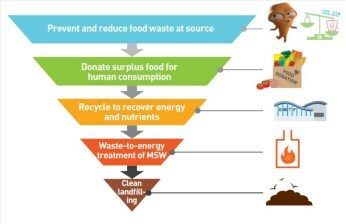 MSW is important to consider because it's effectively a measurement of consumerism - how much waste people produce that goes beyond the absolute basic requirements in life to eat and drink. Notes: You hear four countries, the UK, the US, Denmark and Japan, mentioned very closely together. The possible answers, A, C, E and F, are all heard, and you must be able to distinguish C as the only correct one. These are broad brush strokes, of course, because an important issue is how efficient and clean the burning process is. Another major form of waste treatment is using landfill sites - basically, burying the waste in the earth. Currently, this method is the dominant process used in the UK at over 80%. and is also heavily used in Germany and in the US, while densely populated and mountainous countries such as Switzerland and Japan dispose of relatively little this way. Note: Five possible answers are mentioned. E is the correct answer, because it 'is the dominant process used in the UK'. In the other countries, it is used to varying degrees - from 'heavily' in Germany to 'relatively' in Switzerland and Japan - but not as 'the highest proportion', as the question asks. A third - and much better way of dealing with waste is to recycle it, turning it back into more things we need. It must be said that much depends here on whether further waste is generated by the recycling processes themselves. The UK and Japan have rather poor records in recycling, while Switzerland tops the table in this respect, and reasonably impressive levels are achieved by Denmark and Germany. I really hope that if we all gathered here again ten years from now, these figures would be much higher. Time - and a lot of effort - will tell. Note: Five possible answers are mentioned. Denmark and Germany are 'reasonably impressive', the UK and Japan 'rather poor'. None of these uses 'the highest proportion', as the question asks, but Switzerland 'tops the table in this respect'.